Reach a targeted audience of female decision-makers by advertising in the Trailblazer's Luncheon program, which will be available online during and after the event. We offer a variety of ad sizes to meet your financial commitment. Or promote your products and services face-to-face with Trailblazers attendees at an Exhibitor's Table during the event itself. Review the information below, then scroll down to purchase your Digital Program Ad and/or reserve your Exhibitor's Table. Advertise your products and services to over 300 guests! To be included in the program, full payment and final art files must be received by April 15th. 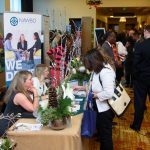 Showcase your business to over 300 business leaders! NOTE: Purchase of an exhibit table does not include a ticket to the luncheon. To purchase a luncheon ticket, click here. Only 10 spots available. Secure yours today! Electricity and WIFI access available at an additional charge. 6-ft. tables will be provided. A limited number of 8-ft. tables available upon request. Registration and payment must be received by April 15th. Files must be press-ready, at least 300 dots per inch (dpi) resolution and should include all fonts and images. Web-sized images and Microsoft Word documents will NOT be accepted.